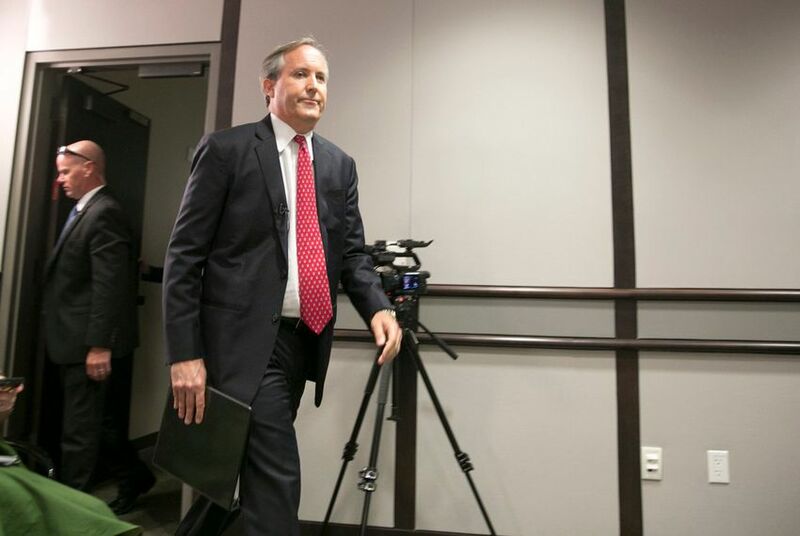 Texas Attorney General Ken Paxton approached at least one other North Texas school district about adopting the transgender student bathroom policy that is now the center of his lawsuit against the Obama administration. He didn't say his office asked the district to pass the policy. On May 16, two top Paxton aides attended a Wichita Falls school board meeting. The board was considering an agenda item regarding gender-specific restrooms and requesting legal representation from the attorney general's office. "This has come down from the attorney general's office, who have asked us to look at a policy here and [said] that they would be willing to on our behalf go and take this to the court system," Sralla said at the meeting, which came three days after the federal government released guidelines instructing school districts to let transgender students use the bathroom that corresponds with their gender identity. "I wish I had brought my crystal ball with me but I left that in Austin," Leonie said. "We are here to reassure you that if you should adopt a policy like is under consideration, we will do what we can to back you and to protect you from the federal government, whether that means being proactive in filing a suit or whether it is responding to a suit, I don't know." "I don't know that my time and the district's time is best suited to do this," he said. The district adopted the policy, he said, out of concern for "safety, security and dignity of the children." Asked to clarify how many school districts the attorney general's office approached about adopting the transgender policy, Paxton spokesman Marc Rylander did not provide a specific number. "When the president unilaterally dictates education policy laced with threats of withdrawing federal funding to schools, our office engages with many concerned parents and school officials from around the state," he said in an email. He also did not respond directly to a question about whether all of the school districts the office approached are in the same general region, and would've fallen under the purview of the same federal court. "We believe that the merits of this case are strong enough to win in any court in the United States," he said.